John Ford's Lightning Ridge Collection is a reflection of a growing passion for opal being shared internationally to produce exquisite and unique jewelry. John Ford has received honors in two categories in the American Gem Trade Association’s 2016 Spectrum Awards. Ford won Platinum Honors in both the evening wear division and the day wear division. The Spectrum Awards is considered the Oscars of the jewelry industry - the most prestigious jewelry and gemstone competition in the world. Ford gained international attention after winning his first Spectrum award in 2014. Since then his Lightning Ridge Collection has received critical acclaim from jewelry editors and fashion stylists throughout the world. Ford’s designs have been seen on the red carpet at the Oscars and the Emmys. The Lightning Ridge Collection is now available throughout the United States in fine jewelry stores. “Winning my first Spectrum in 2014 was a thrill and total surprise. It has allowed me to share the most beautiful gemstone in the world, the Lightning Ridge Opal, with thousands of people. There is no higher honor for a jewelry designer than winning multiple Spectrum awards. Getting that special call again today from New York was just as exhilarating as the first time. There is something words can’t fully express about competing against hundreds of the world’s top designers, and having such a distinguished panel of judges recognize your piece as the best,” said Ford. 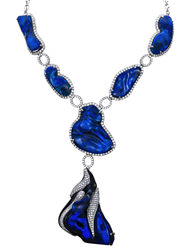 Ford’s 2016 Spectrum Award winning designs include a magnificent “electric blue” black opal and diamond necklace with 197 carats of Lightning Ridge Back Opals accented by 6.27 carats of fine white diamonds set in platinum; and a ladies black opal and diamond “mirror design ring,” featuring a 3.65 carat Lightning Ridge Black Opal accented by .69 carats of fine white diamonds set in platinum. John Ford sources Black Opal exclusively from Lightning Ridge Australia for his Black Opal and diamond designs. The designs may be viewed at http://www.LightningRidgeCollection.com/. For more information, contact John Ford via phone at (409)771-7750, or email at john(at)lightningridgecollection(dot)com. One of AGTA's biggest contributions in the promotion of color has come from its AGTA Spectrum Awards™ and Cutting Edge Awards competitions. The AGTA Spectrum Awards™ is considered the most respected and prestigious creative award for the design industry. Launched in 1984, the AGTA Spectrum Awards™ honors, recognizes and promotes designers whose work utilizes natural colored gemstones and cultured pearls in finished fine jewelry design. It has become the benchmark for jewelry designers striving to gain recognition for their work. In 1991, the AGTA created the Cutting Edge Awards to honor creativity in lapidary arts, including faceted gems and pearls, carvings, and objects of art. Both are a true contest of workmanship, creativity and innovation. Winners set the standards of excellence for our entire industry. The Spectrum Awards competition has launched trends, increased visibility for designer jewelry, and inspired great innovation in use of color and materials. The Spectrum Awards is considered the finest jewelry and gemstone competition in the world. The judging panel changes each year and consists of experts from different disciplines within the jewelry industry. Each piece is examined by hand with an eye for craftsmanship and quality of the materials used.